This post is spoiler-free, unless you consider non-story aspects of the show's premise to be spoilers. The surprise TV hit of the summer is Mr. Robot, a USA Network series following a bug-eyed, hoodie-wearing New York City security analyst and (it goes without saying) hacker. In this summer of Ashley Madison hacks, Donald Trump lunacies, and now stock market worries, perhaps we shouldn't be surprised that a show about subverting corporate and political forces is a big commercial and critical success. Not only is Mr. Robot unusually accurate in its depiction of hackers and coding, it feels real in other ways: angst about Facebook mediating our relationships, nonchalance about iPhones and Androids doing the same, a creeping fear that nothing is truly secret, and workplace derision of the last guy still using a BlackBerry. It's the first show to reflect back at us the world we see when we peer into our laptop screens. Mr. Robot's attention to detail extends to the show's iconography, especially its brands and logos: the series is populated with fictional corporations and vigilante groups which seem as if they could exist in reality. And in some ways they do: series creator Sam Esmail was personally involved—"to a fault," he says—with developing these invented brands from elements of genuine ones. With the series finale coming this Wednesday, let's take a look at the four most interesting logos: Mr. Robot computer repair, the ominous conglomerate E Corp., network security firm Allsafe, and the mysterious underground hacker network fsociety. It's more than just a similarity. If you look at the show's "Previously On" screen, Mr. Robot's "V" is clearly SEGA's "A" upside-down. Only thing is, the SEGA logo doesn't necessarily come from a fully-developed character set. The company has been using its own variation on a variation of Robert Trogman's Yagi Double since the early 1980s, and corporate branding often involves modifying existing fonts to suit a company's specific needs. The most famous example is, arguably, the origin story of the FedEx logo. Indeed, the Nise Sega font is where the "M" in Mr. Robot comes from, especially when compared to the somewhat more faithful Trogman knockoff featured at the same link. Given the differences noted by SEGAbits, it wasn't long before a fan posted yet another variant to Reddit, making small modifications to Nise Sega to match Mr. Robot's customizations. It's available for download... if you dare trust that link. Bonus Yagi Double observation: Battlestar Galactica used another variation in both its original series and 2000s iteration. However, the existence of a font called Mr. Robot, by Hipopotam Studio, appears to be entirely a coincidence. Esmail probably shouldn't be too smug about this: Enron may no longer exist, but the Enron Creditors Recovery Corp. most certainly does. Although this seems open and shut, we're not quite done here. While re-watching the pilot episode this weekend, I noticed that the rotated E looks different in some shots, and I believe this means something. Without spoiling anything, it seems intentional that the full extent of E Corp's business activities is never explained, allowing viewers to imagine (the worst) for themselves. What we do see: it makes tablets and music software (eTunes) like Apple, and commodity computer hardware like Dell. It provides cloud services like Microsoft, and financial services like Bank of America. Nope, I was right. It looks like that, too. The logo here is definitely similar, but also more subtle. The three servers encircled in the Allsafe mark are superficially similar to the "good hands" illustrated image in the the Allstate logo. As for the typeface, the real Allstate logo seems to use a modified version of Tahoma, with an obviously customized slanting "A" and maybe a truncated cross-stroke on the lowercase "t". The fictional Allsafe logo uses what appears to be a lighter weight of Tahoma, with considerably looser kerning (space between characters). Close enough to be evocative, but no need to be too obvious. After all, the name does that for you. At last we come to the mysterious hacker group fsociety, primarily inspired by the real-life hacker collective Anonymous, perhaps also by the Occupy Wall Street movement, and finally, definitely, Fight Club's Project Mayhem. 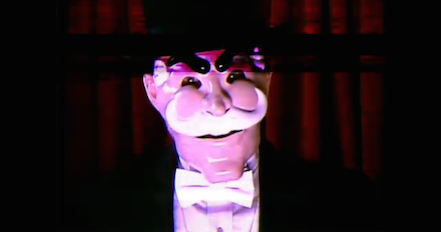 The grinning mask face—in its iconic representation at left; from the series itself at right—references the Guy Fawkes masks favored by Anonymous. Not to mention, the modern style of Guy Fawkes mask is itself borrowed from fiction: it originated with the V for Vendetta graphic novel, and was later popularized by the 2006 film version. But there is another element in play: the OBEY posters designed by Los Angeles street artist Shepherd Fairey, aka the HOPE poster guy. This is where the high contrast black and white color scheme comes from, likewise the tendency toward the use of heavy lines. Indeed, the face on the fsociety mask looks to be about halfway between Guy Fawkes and the OBEY giant (note the protruding jawline). [Update: An astute reader points out the mustache is likely influenced by Rich Uncle Pennybags, aka Mr. Monopoly.] If that feels like a lot of borrowings, well, you may be interested to know that Fairey himself is often criticized for appropriating images and styles from others, and that criticism includes OBEY itself. There is a huge difference, of course: Adbusters is anti-consumerist and anti-capitalist. USA Network, a division of NBCUniversal, itself owned by Comcast, is anything but. Mr. Robot plays on themes of anarchism and culture jamming, but nothing in Sam Esmail's interviews would suggest he is an anarchist or Marxist personally. Whether one should be bothered by this appropriation of anti-capitalism agitprop for consumer programming by capitalists I'll leave to art critics and undergraduate sociology courses. But Mr. Robot might also put us in mind of the surprise publishing hit of last summer: Thomas Piketty's Capital in the Twenty-First Century, which became an international bestseller by claiming to identify new contradictions in global capitalism. Given our unease about modern society—and especially the global markets and communications technologies that shape it—we shouldn't be surprised by its success at all. We're not really done with capitalism, but the thought of it makes for good summer entertainment. If you know anything I don't, disagree with a particular judgment call, or catch any outright errors, please send them to hello@beutlerink.com and we'll update this post. Meantime, your last chance for Mr. Robot this season is Wednesday, August 26 at 10pm / 9pm Central, after which I am sure you can figure out how to find it on the Internet.